Besides Schema Editing and Schema Mapping, transformation can be carried out using objects called transformers. As the name suggests, a transformer is an FME Workbench object that carries out transformation of features. There are lots of FME transformers, each of which carry out many different operations. Transformers are connected somewhere between the Reader and Writer feature types, so that data flows from the Reader, through a transformation process, and on to the Writer. Transformers usually appear in the canvas window as rectangular, light-blue objects. Each transformer may have a number of parameters (settings). Access the parameters by clicking the parameter button at the top right of each transformer. The parameter button on a transformer is color-coded to reflect the status of the settings. A blue parameter button indicates that the transformer parameters have been checked and amended as required, and that the transformer is ready to use. A yellow parameter button indicates that the default parameters have not yet been checked. The transformer can be used in this state, but the results may be unpredictable. 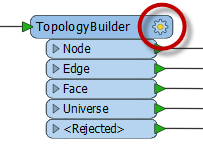 A red parameter button indicates that there is at least one parameter for which FME cannot supply a default value. The parameter must be provided with a value before the transformer can be used. Good morning everyone, I&apos;m First Officer Transformer and I&apos;d like to welcome you aboard today&apos;s training. Please be sure to check your parameters before your try to take off. Your workspaces just won&apos;t fly if there are any red-flagged transformers in them! Far from having just a single input and/or output, a transformer can have multiple input ports, multiple output ports, or both. This 2DForcer transformer has a single input and output port. This Clipper has multiple input and output ports. Notice that not all of them are – or need to be – connected. …whereas this Creator has only a single output port! Click on the drop-down arrow of a transformer output port to see all of the attributes that exit the transformer. This includes all changes applied within the transformer. 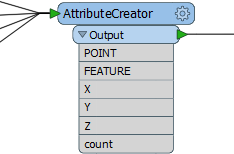 This is a good way to visualize which attributes have been created or lost within the transformer.